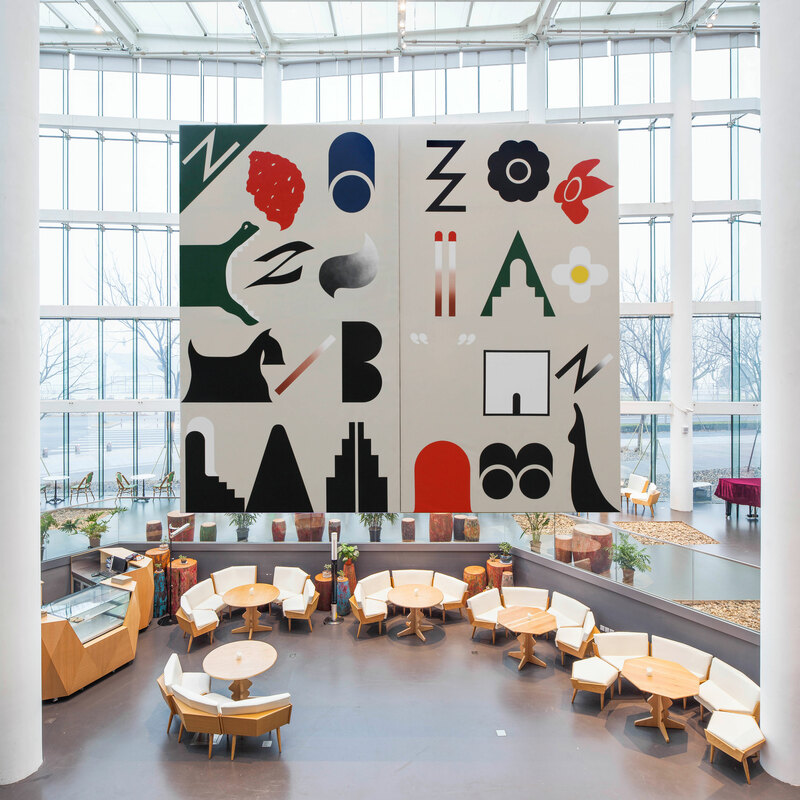 Los Angeles-based artist Math Bass creates a site-specific mural for the Hammer’s lobby wall. Working across a range of media, including painting and sculpture, Math Bass employs a distinctive language of abstract, brightly colored shapes and images to explore notions of multiplicity. Their stylized forms, from bones doubling as speech bubbles to teeth resembling a set of stairs leading into a crocodile’s mouth, are rendered deliberately ambiguous and often installed to mirror each other across two and three-dimensional works. 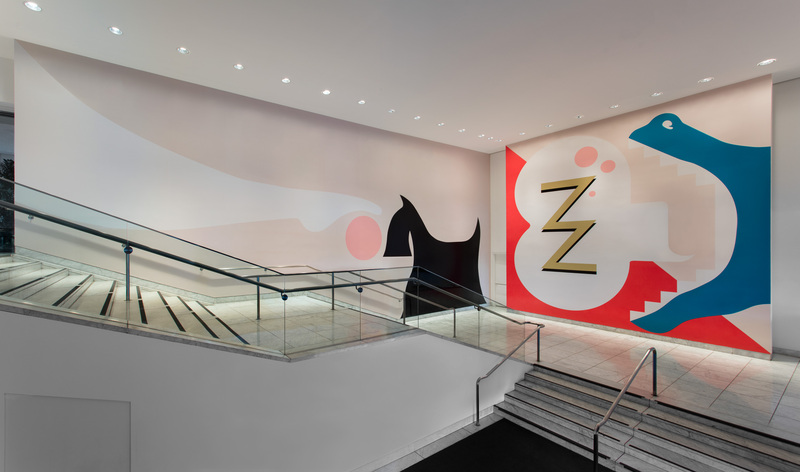 Playing with bodily and architectural scale for the Hammer Museum’s lobby wall, Bass invites the viewer to inhabit a liminal space where definition and hierarchy are playfully subverted to allow for new possibilities of experience. Hammer Projects: Math Bass is organized by Connie Butler, chief curator, with Vanessa Arizmendi, curatorial assistant. Math Bass (b. 1981, New York) is a Los Angeles–based interdisciplinary artist whose practice includes painting, sculpture, sound, video, and performance. They earned their BA from Hampshire College in 2003 and an MFA from UCLA in 2011. Bass has had solo exhibitions at Yuz Museum, Shanghai (2017); Tanya Leighton, Berlin (2017); Michael Jon Gallery, Miami (2016); MoMA PS1, Long Island City, NY (2015); and Overduin & Co., Los Angeles (2014). Their work has also been included in group exhibitions at Silberkuppe, Berlin (2014); White Flag Projects, St. Louis (2014); Night Gallery, Los Angeles (2013); and Human Resources, Los Angeles (2013). Bass participated in the Hammer Museum’s Made in L.A. biennial in 2012. Math Bass is an artist who is fluent in ambiguity. Locating their work in a territory that hovers between the speech bubble and the unspeakable, Bass creates visual situations that take the form of highly composed, elegantly stylized paintings. That the artist’s glyphs and signs exist as paintings is a conceptual choice that locates the work in a monumental and heavily signified tradition that Bass seeks to upend. Their flat, colorful painted compositions become, like their sculpture, just another prop or sign to decorate and punctuate a space. In a 2015 interview Bass described their art as a “form of ventriloquism.” Composed digitally, the paintings are constructed through the working out and reworking of an archive of signs. Drawing the forms and sorting them into combinations that conceal meaning as much as they reveal it, Bass constructs a language of earnest obfuscation. Recalling the American singer Scott Walker’s comments about his mode of address, Bass said, “he talked about wanting his voice to just be the sound of a man singing.”1 This describes the affect of Bass’s paintings as well. Anyone who knows the cultish Walker, whose own relationship to any genre of song making or even music was both highly unstudied and deeply strange, can imagine his earnestly “masculine” baritone stylings as a weird sound track for Bass’s flat compositions. Like Walker, whose relationship to irony is miraculously one of distance if not utter disregard, Bass holds a center between the guffaw and the deadpan. In fact Bass chooses sincerity over irony, a position and a voice that are a bit uncharacteristic for their generation. Bass is truly interested in slowing the viewer’s time and experience with the work by creating a linguistic situation that must be read or deciphered with some care and dedication. For the Hammer Museum’s lobby wall, Bass has created a monumental painting that is an iteration of the ongoing series Newz!Ripped from the headlines of a nostalgic past when newspapers broadcast content and billboards were meaningful ways of getting the word out to a public that was paying attention, Bass’s languid mural stretches across the Hammer’s grand stairway entrance and beckons the viewer into the museum. The central panel is composed of a long, pointing leg whose toe just twitches the nose of a coiffed black terrier. Such a leg and such a dog seem to belong to a bygone era of musicals and queer signifiers of beauty and sophistication. 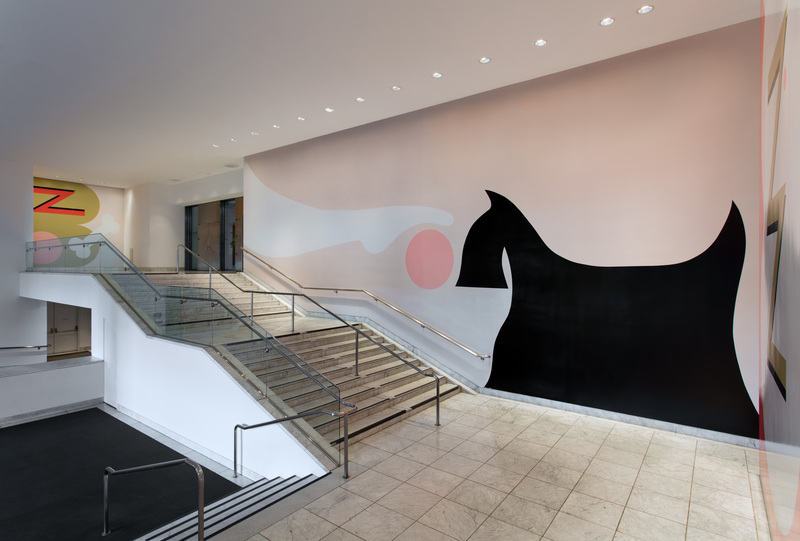 Held in tension by a floating, bubble gum pink orb, these forms are anchored to the corners and transition points of the architecture: the terrier faces off at the base of the stairway; the leg extends from the highest corner of the space. All the images float on a bland beige ground, the color equivalent of Muzak, the background noise of banality. The arching leg is Bass’s own design but riffs on a Bloomingdale’s logo scheme circa 1973, when Massimo Vignelli designed the now famous and familiar “big brown bag.” The brown paper of the generic shopping bag somehow rings true with the generic, often numbing experience of mass consumption. Generic and timeless, the curves of Bass’s leg echo Vignelli’s typography, which spoke simultaneously of luxury and the quotidian. For Bass the beigeness of it all finds the perfect embodiment in the project’s most subtle protagonist, the presence of the weave of the original canvas. Each of these large compositions began as a painting that was then photographed to be reproduced as wallpaper. Discernible only with close inspection, the background color bears little specks and traces of the original weave of the untreated canvas. Like highly produced wallpaper in a rich interior, small details are translated with great care and attention, and in maintaining the presence of painting, even in a visual experience so removed from it, the artist is offering a wink and a nod. The large pink bubbles similarly suggest a thought bubble or a playful blip in the composition, floating among other, more immediately recognizable images. A different creature makes an appearance on the side walls with jaws open, as if uttering something like language. 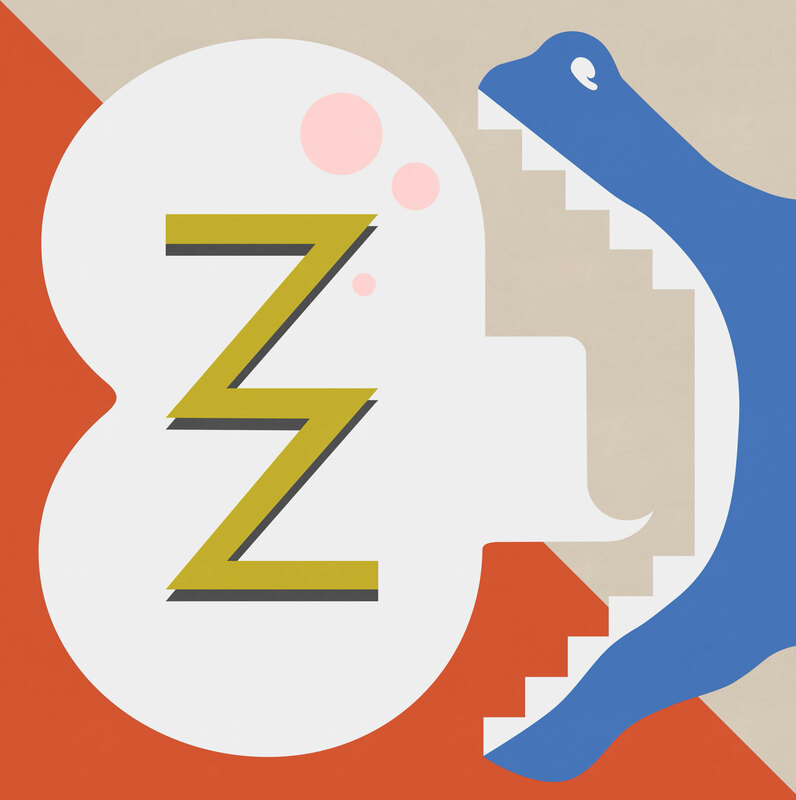 Bass has frequently used alligator jaws, both as a gaping abstract form and as a means of framing a thought or speech bubble. Sound or its opposite is always present, as it is in their performances and sculptures. The idea of the audio drone or background noise finds visual form in these compositions, but the problem of language as sound figures as one of the artist’s recurring performance tropes. Bass is interested in how bodies move through space and are both narrated and disrupted by language. In the paintings the image of sound—a dog’s open muzzle, the languid adagio of a curving leg, a speech bubble—calls attention to its absence. Painting is a profoundly mute medium, and painting as wallpaper is doubly so. The flatness of Bass’s newsy compositions suggests liminality. Perhaps functioning as a subtle critique of wafts over the viewer and envelops the visual landscape for only a moment, soon to be forgotten. Art Journal, December 14, 2015, artjournal.collegeart.org. Hammer Projects: Math Bass is made possible, in part, by Maharam.